Otoplasty refers to a group of plastic surgery procedures done to correct deformities of or disfiguring injuries to the external ear. It is the only type of plastic surgery that is performed more often in children than adults. To reconstruct an external ear in children who are born with a partially or completely missing auricle (the visible part of the external ear). This type of birth defect is called microtia; it occurs in such disorders as hemifacial microsomia and Treacher Collins syndrome. Most cases of microtia, however, involve only one ear. To correct the appearance of protruding or prominent ears. This procedure is also known as setback otoplasty or pinback otoplasty. To correct major disparities in the size or shape of a patient's ears. To reshape deformed ears. One congenital type of deformity is known as Stahl's ear, which is characterized by a pointed upper edge produced by the flattening of the ear rim and folding of the cartilage. Stahl's deformity is also known as Vulcan ear or Spock ear because it resembles the ears of the well-known Star Trek character. Otoplasty is considered reconstructive rather than cosmetic surgery. Consequently, it is often covered by health insurance. People who are considering otoplasty for themselves or their children should check with their insurance carrier about coverage. The average surgeon's fee for an otoplasty in the United States in 2001 was $2,168. Otoplasty is not done to correct hearing difficulties related to the structures of the middle and inner ear. Hearing problems are treated surgically by otolaryngologists (physicians who specialize in ear, nose, and throat procedures). Statistics for congenital deformities of the external ear are difficult to obtain because the causes are so diverse. Such genetic disorders as Treacher Collins syndrome and hemifacial microsomia affect between one in 3,500 and one in 10,000 children. In addition, microtia has been associated with certain medications taken during pregnancy—particularly anticonvulsants, which are drugs given to treat epilepsy, and isotretinoin, a drug prescribed for severe acne. Stahl's deformity is found more often among Asian Americans than among Caucasian or African Americans. As of 2003, it is thought to be a hereditary disorder. are no exact statistics on the incidence of protruding ears in the general population, although about 8% of patients treated for this deformity have a family history of it. Large or protruding ears appear to be equally common in males and females; however, it is easier for girls and women to avoid social discomfort by styling their hair to cover their ears. This factor may explain why a slight majority (53%) of setback otoplasties is done on boys. Although most setback otoplasties are performed in children between the ages of four and 14, the second largest group of patients in this category is women in their 20s and 30s. The most common cause of trauma requiring otoplasty is human and animal bites. Although exact figures are not known because many bite cases are not reported, a large percentage of dog and human bites cause wounds on the head and neck. With regard to human bites, the single most common injury requiring medical treatment is auricular avulsion, or tearing of the external ear. In the United States, 93% of patients treated for ear injuries caused by human bites are males between the ages of 15 and 25. Most cases of auricular avulsion in children, however, are caused by dog bites, which are likely to cause crushing as well as tearing of the tissues. Although statistics cover bites on all parts of the body, it is still noteworthy that plastic surgeons in the United States performed 43,687 operations to repair injuries caused by animal bites in 2001. Otoplasty in children is performed under general anesthesia; in adults, it may be done under either general anesthesia or local anesthesia with sedation. Most otoplasties take about two or three hours to complete. 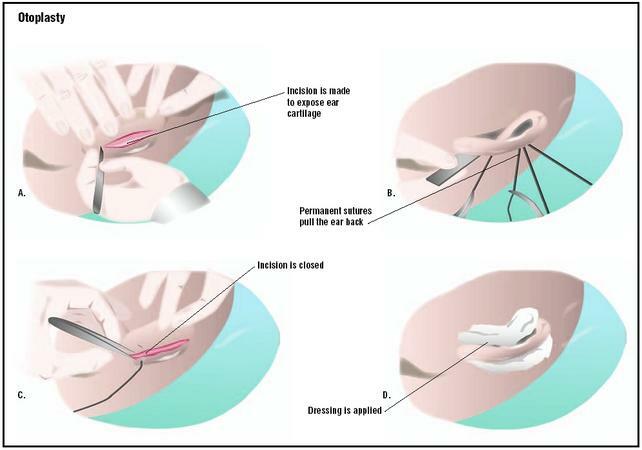 Many plastic surgeons prefer to use absorbable sutures when performing an otoplasty in order to minimize the risk of disturbing the shape of the ear by removing stitches later. Otoplasty for microtia requires a series of three or four separate operations. In the first operation, a piece of cartilage is removed from the child's rib cage on the side opposite the affected ear, so that the surgeon can use the natural curve of the cartilage in fashioning the new ear. The surgeon works from a template derived from photographs and computer models when he or she carves the cartilage into the desired shape. The cartilage is then carefully positioned under the skin on the side of the face. The skin will shape itself to fit the cartilage framework of the new ear. The second and third operations are done to shape the ear lobe and to raise the new ear into its final position. There is no universally accepted single technique for performing a setback otoplasty. Variations in the procedure are due partly to the different causes of ear protrusion. The patient's ear may have a large concha (the shell-like hollow of the external ear); the angle of the fold in the ear cartilage may cause the ear to protrude; or the ear lobe may be unusually large. After the patient has been anesthetized, the surgeon makes an incision behind the ear in the fold of skin where the ear meets the head. In one technique, the surgeon exposes the ear cartilage beneath the skin and reshapes it or removes a small piece. The cartilage is bent back toward the head and secured in place with non-removable sutures. Removal of cartilage is sometimes referred to as a conchal resection. Another procedure for protruding ears involves the removal of skin and suturing the cartilage back on itself. This technique reshapes the ear without the need to remove cartilage; it is sometimes called a cartilage-sparing otoplasty. After the surgeon has finished reshaping the ear and carefully drying the area, the incision is closed. The surgeon covers the ear with a cotton dressing moistened with mineral oil or other soft dressing. Diagnosis of microtia is made by the obstetrician or pediatrician at the time of the child's birth. The diagnosis of prominent or protruding ears, however, is somewhat more complex because the deformity is a matter of shape and proportion rather than the absence or major malformation of a body part. The head of a newborn infant is larger in proportion to its body than is the case in adults, and as a result, the shape of the ears may not concern the parents until the child is two or three years old. Otoplasty to correct microtia is usually started when the child is at least five years old. The surgeon must remove a portion of rib cartilage in order to construct a framework for the missing ear, and children younger than five may not have enough cartilage. In addition, it is easier for the surgeon to use the child's normal ear as a model for the size and shape of the reconstructed ear when the child is five or seven years old. Otoplasty for microtia is preceded by consultations between the surgeon and the child's parents. Following the diagnosis, a comprehensive treatment plan is made that includes long-term psychosocial as well as surgical follow-up. The reconstruction of a missing ear must be done in several stages because the surgeon must allow for changes in the proportions of the child's face and skull as he or she matures as well as attempt to make the new ear look as normal as possible. As of 2003, there is some debate among plastic surgeons concerning the best age for performing a setback otoplasty. Many recommend the operation when the child is between five and seven years old. One reason is that the human ear has attained 85–90% of its adult size by this age, and therefore the surgeon can estimate the final size and shape of the ear with considerable accuracy. In addition, the cartilage in the ear is still relatively soft and easier for the surgeon to reshape. Another reason for performing an otoplasty in children in the early elementary school years is psychological; name-calling and teasing by peers can be emotionally destructive for children in this age bracket. On the other hand, some surgeons have reported performing setback otoplasties on children as young as nine months with no disturbances in the growth of the ear or recurrence of the problem. Preparation for otoplasty in children should include an assessment of the child's feelings about the procedure. Some surgeons consider opposition on the child's part to be a contraindication for surgery, as well as unrealistic expectations on the part of the parents. In general, a positive attitude is associated with faster recovery and better overall results. Preparation for otoplasty in adults includes a physical examination and standard blood tests. Patients are usually advised to discontinue taking aspirin and any other medications that thin the blood for two weeks prior to surgery. Plastic surgeons strongly urge adult patients to quit smoking before the surgery, because smoking delays and complicates the healing process. Adult patients are also asked to shower and shampoo their hair thoroughly on the morning of the procedure. Men should have a haircut or trim a day or two before surgery; women should braid or pin their hair close to the head. Avulsion injuries caused by bites, thermal or chemical burns resulting from industrial accidents, and other traumatic injuries of the auricle are diagnosed by emergency physicians. Plastic surgery for traumatic injuries of the auricle is preceded by thorough cleansing of the wound and debridement of damaged tissue. It is important to treat ear injuries promptly because the ears are not well supplied with blood vessels. This characteristic makes it easier for infection to develop in parts of the auricle where the skin has been torn open or crushed. In some cases, plastic surgery is postponed for a few days and the patient is given oral penicillin to prevent infection. After an otoplasty, the patient's head is wrapped with a turban-type bandage that is worn for four or five days following surgery. The patient is instructed to wear a ski-type headband over the ears continuously for about a month after the turban is removed, and then at night for an additional two months. Warm compresses should be applied to the ears two or three times a day for two weeks after the turban is removed. Patients should follow the surgeon's instructions about washing their hair, and avoid holding hot-air blow dryers too close to the ear. Patients should also avoid contact sports for at least three months after otoplasty. An anti-inflammatory medication (Kenalog) can be applied to the ear in the event of abnormal scar formation. Some risks associated with otoplasties are common to all operations performed under general anesthesia. They include bleeding or infection of the incision; numbness or loss of feeling in the area around the incision; and a reaction to the anesthesia. Formation of abnormal scar tissue. This complication can usually be corrected later; plastic surgeons advise waiting at least six months for revision surgery. Hematoma, which is a collection of blood within a body organ or tissue caused by leakage from broken blood vessels. In the case of the ear, a hematoma can damage the results of plastic surgery because it creates tension and pressure that distort the final shape of the ear. Careful drying of the ear at the end of the procedure and application of a pressure bandage can reduce the risk of a hematoma. In the event that one develops, it is treated by reopening the incision and draining the collected blood. Distortion of the shape of the ear caused by overcorrection of deformed features. Reappearance of ear protrusion (in setback otoplasty). This complication is most likely to occur in the first six months after surgery. The normal result of an otoplasty is a reconstructed or reshaped ear that resembles a normal ear (or the patient's other ear) more closely. In a setback otoplasty, the normal result is an ear that lies closer to the patient's head without an overcorrected, "pinned-back" look. The mortality rate in otoplasty is extremely low and is almost always associated with anesthesia reactions. The most common complication reported is asymmetrical ears (18.4%), followed by skin irritation (9.8%); increased sensitivity to cold (7.5%); soreness when the ear is touched (5.7%); abnormal shape to the ear (4.4%); loss of feeling in the ear (3.9%); bleeding (2.6%); and hematoma (0.4%). Some ear deformities in children, including protruding ears and Stahl's deformity, can be treated with ear molding in the early weeks of life, when the cartilage in the ear can be reshaped by the application of splints and Steri-Strips. One technique involves making a mold in the shape desired for the child's ear from dental compound and attaching it to the ear with methylmethacrylate glue. The ear and the mold are held in place with surgical tape and covered with a tubular bandage or ear wrap for reinforcement. The mold and tape must be worn constantly for six weeks, with a change of dressing every two weeks. Ear molding is reported to be about 85% effective when it is started within six weeks after the baby's birth. It costs less than surgery—about $600—and is considerably less painful. The chief disadvantage of ear molding is its ineffectiveness in treating ear deformities characterized by the absence of skin and cartilage rather than distorted shape. There are no effective alternatives to otoplasty in treating ear deformities or injuries in adults; however, some plastic surgeons use custom-made silicone molds to help maintain the position of the ears in adult patients for several weeks after surgery. See also Craniofacial reconstruction ; Pediatric surgery . "Chromosomal Abnormalities." Section 19, Chapter 261 in The Merck Manual of Diagnosis and Therapy, edited by Mark H. Beers and Robert Berkow. Whitehouse Station, NJ: Merck Research Laboratories, 1999. "Drugs in Pregnancy." Section 18, Chapter 249 in The Merck Manual of Diagnosis and Therapy, edited by Mark H. Beers and Robert Berkow. Whitehouse Station, NJ: Merck Research Laboratories, 1999. "External Ear: Trauma." Section 7, Chapter 83 in The Merck Manual of Diagnosis and Therapy, edited by Mark H. Beers and Robert Berkow. Whitehouse Station, NJ: Merck Research Laboratories, 1999. Sargent, Larry. The Craniofacial Surgery Book. Chattanooga, TN: Erlanger Health System, 2000. Aygit, A. C. "Molding the Ears After Anterior Scoring and Concha Repositioning: A Combined Approach for Protruding Ear Correction." Aesthetic Plastic Surgery, 27 (March 14, 2003) [e-publication ahead of print]. Bauer, B. S., D. H. Song, and M. E. Aitken. "Combined Otoplasty Technique: Chondrocutaneous Conchal Resection as the Cornerstone to Correction of the Prominent Ear." Plastic and Reconstructive Surgery, 110 (September 15, 2002): 1033–1040. Caouette-Laberge, L., N. Guay, P. Bortoluzzi, and C. Belleville. "Otoplasty: Anterior Scoring Technique and Results in 500 Cases." Plastic and Reconstructive Surgery, 105 (February 2000): 504–515. Furnas, D. W. "Otoplasty for Prominent Ears." Clinics in Plastic Surgery, 29 (April 2002): 273–288. Gosain, A. K., and R. F. Recinos. "Otoplasty in Children Less than Four Years of Age: Surgical Technique." Journal of Craniofacial Surgery, 13 (July 2002): 505–509. McNamara, Robert M. "Bites, Human." eMedicine, April 25, 2001 [April 7, 2003]. http://www.emedicine.com/emerg/topic61.htm . Manstein, Carl H. "Ear, Congenital Deformities." eMedicine, June 20, 2002 [April 6, 2003]. "www.emedicine.com/plastic/topic207.htm> . Peker, F., and B. Celikoz. "Otoplasty: Anterior Scoring and Posterior Rolling Technique in Adults." Aesthetic Plastic Surgery, 26 (July–August 2002): 267–273. Vital, V., and A. Printza. "Cartilage-Sparing Otoplasty: Our Experience." Journal of Laryngology and Otology, 116 (September 2002): 682–685. Yugueros, P., and J. A. Friedland. "Otoplasty: The Experience of 100 Consecutive Patients." Plastic and Reconstructive Surgery, 108 (September 15, 2001): 1045–1051. FACES: The National Craniofacial Association. P. O. Box 11082, Chattanooga, TN 37401. (800) 332-2373. http://www.faces-cranio.org . National Organization for Rare Disorders (NORD). 55 Kenosia Avenue, P. O. Box 1968, Danbury, CT 06813-1968. (203) 744-0100. American Academy of Facial Plastic and Reconstructive Surgery. 2001 Membership Survey: Trends in Facial Plastic Surgery. Alexandria, VA: AAFPRS, 2002. American Academy of Facial Plastic and Reconstructive Surgery. Procedures: Understanding Otoplasty Surgery, [April 6, 2003]. http://www.facial-plastic-surgery.org/patient/procedures/otoplasty.html . American Society of Plastic Surgeons. Procedures: Otoplasty, [April 5, 2003]. http://www.plasticsurgery.org/public_education/procedures/Otoplasty.cfm . Otoplasties for microtia and prominent or deformed ears are specialized procedures performed only by qualified plastic surgeons. Plastic surgeons are doctors who have completed three years of general surgical training, followed by two to three years of specialized training in plastic surgery. There are, however, relatively few plastic surgeons who perform otoplasties for microtia. Ear molding as an alternative to surgery is performed by a plastic surgeon as an outpatient or office procedure. Traumatic injuries of the external ear are treated initially by an emergency physician, trauma surgeon, or plastic surgeon; in most cases, an otolaryngologist is consulted to determine whether the inner structures of the ear have also been injured. Revision plastic surgery may be performed later to remove scar tissue. How long will it take for the ear to assume its final shape? How much change in the shape of the ear can be reasonably expected? Would my child benefit from ear molding rather than surgery? How many otoplasties have you performed? I have had an otoplasty surgery about 18 mounts age . about 1 or 2 weeks after surgery a wound appeares on both of my ears . the result was that in that parts my ears cartilage is became red andthin and very small with concavity shape. and also it leads my ears not to stick to my head ( they have bend from the eara of wound). My Dr. believes that this happens just because the skin of that part has dameneged and he believes that this problem could be solved my ziplasty ( that can make my skin longer on that part) . I would be gratefull if your experts can guid me on this position and also I want to know have you ever had any similar problem in your patient and can you solve the problem. Also please kindly advise meare you agree with my Dr. `s idea about zi plasty or not. I liked your site. I liked your site. i liked your site.